the. reign. of. waxed. field. jackets. - bitte.und.danke. Was it just me or was January a doozy? In the midst of unseasonably warm weather (for the most part anyway), I still somehow struggled with an extreme case of the winter blues. How many days until spring again? Do I even want to know? Probs not, but according to Punxsutawney Phil, we still have at least six more weeks of winter to endure. Womp, womp. On a positive note: The blasé days of January inspired me to keep the outfits coming. As a rule of thumb — whether it’s a rainy day, an important class presentation (I’m no longer in school anymore, but you get the idea) or a mundane Monday, an extra on-point ensemble can never steer you wrong. For the sake of having a productive work sesh, I often times will pull out all the stops just to feel more in the zone. One particular pièce de résistance that’s been on repeat lately is this long waxed downtown field jacket from J.Crew featuring military-inspired details and a corduroy collar. The dark forest green hue doesn’t hurt either. It’s no overstatement when I say that I reach for it almost every. Freaking. Day. Rain or shine, work or play, it always comes through. What can I say? I love it’s off-duty appeal and the fact that it can be dressed up or down. While I love wearing it with plain ol’ jeans or black high-waisted skinnies, I’m equally obsessed with how it looks teamed alongside a mini skirt or a casual dress. To show you how it’s done, I’m sharing two different ways that I’ve styled my go-to topper of the season. Outfit #1: I call this my unofficial weekend uniform. There are few things that I love more than a gingham button-down — even better if it’s knotted into a bow. I paired it alongside my favorite Industry Standard Margot high-waisted jeans and a pint-sized Kate Spade cross-body bag (which holds just the essentials BTW!) for a look that reads girl-on-the-go. Perfectly put-together with a hint of prep, just the way I like it. Outfit #2: Though a smidge more on the dressier side, I would also consider this to be an off-duty #OOTD. My field jacket instantly dials down the appearance of my jacquard mini skirt and lace-trimmed blush pink sweater (so pretty!) making it more suitable for the daytime. Since it was a bit nippy out, I opted for polka dot-printed tights and velvet penny loafers. 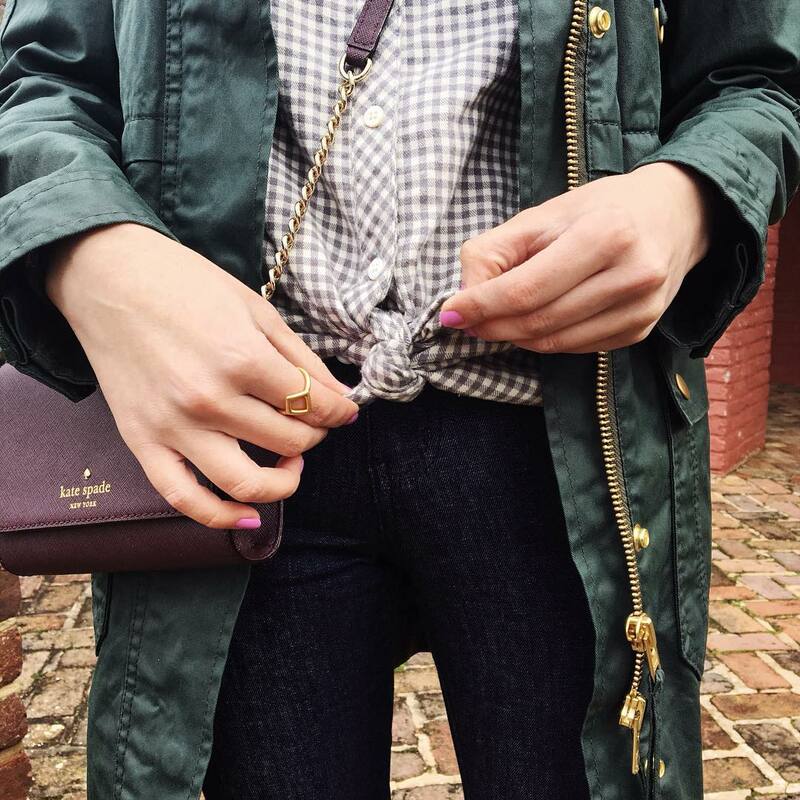 What are your go-to ways to style a field jacket? Let me know in the comments below! Thanks so much! It's definitely my hero piece at the moment! I've been LOVING jackets like this one lately! They're kind of water proof without being full fledged rain jackets. They're also super stylish. Barbour makes some cool versions of this type of jacket too! Love!